Situated in the town of Nyaung-U in Yangon near the famous Ayeyarwady River, it was first constructed by King Anawrahta in 1076 and completed by King Kyansittha in 1102. The king then built his palace near the pagoda. Other than being known for its shimmering golden beauty, the pagoda is home to a stone pillar containing ancient Mon inscriptions dedicated to King Kyansittha; it is also believed to be in possession of one of only four replicas of Gautama Buddha’s tooth. The actual revered tooth is in Kandy, Sri Lanka; the three other replicas are enshrined in three different pagodas around Myanmar, namely the small Lawkananda Pagoda on the southern end of Yangon, Tan Kyi Taung or Tant Kyi Hill Pagoda on the western bank of the Ayeyarwady River, and Tu Yuan Taung or Tu Yuan Hill Pagoda, which is on top of a hill. Many Burmese believe that if they can visit all four replicas in one day, prosperity and good luck will come their way. Shwezigon is a circular golden pagoda that is surrounded by smaller shrines and temples. It was built as the most important shrine and repository, a center for prayer and meditation for Theravada Buddhism; it is the prototype of Burmese stupas that are scattered by the thousands in the ancient city of Bagan. The gracefully bell-shaped Shwezigon sits on three rising terraces, with panels of enameled plaques on the base portraying scenes from the lives of the Buddha. The plaques are known as the 550 jatakas. There are four shrines with a 4-meter-tall bronze Buddha statue in each. These are important Buddha figures because it is believed that they are the oldest surviving images from ancient times. They are assuming the “no fear” gesture also known as “abhaya”, with the right hand held palm outward and fingers straight up. Inside the pagoda are a number of ancient relics, which include the Thagyamin figure, the Magic Horse of King Kyanzittha and several Buddha relics, while outside are a cluster of rest houses (zayats) and shrines. Another noteworthy feature of this important pagoda is that it is known to be the site where the Myanmar King endorsed 37 images of pre-Buddhist “nats” or spirits. The ancient spirit images are on display today under a protective shed. The original stone statue of Thagyamin, the king of the nats and a representation of Indra the Hindu god, is found at the eastern end of the shed. This Thagyamin statue is the oldest known figure of its kind in Myanmar. Another important nat statue is that of Mae Wunna, found in a tiny shrine at the southeastern part of the pagoda and “protected” by tiger statues. Mae Wunna is the guardian nat of important Burmese herbs and medicinal plants. 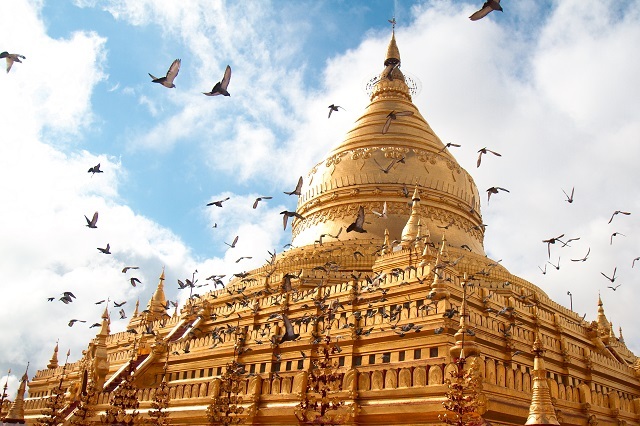 There is an entry fee when visiting Shwezigon Pagoda and it is definitely worth it. There are additional fees when carrying in a camera or video camera.